Traveling is another way to get your work seen and chance to meet people and making new contacts. There are art exhibits (shows) in every state across the country. 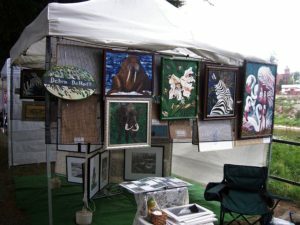 Thinking out of the box is what an artist does best so look for places that have exhibitor booth fees. The fees can range from $35 to $1,000’s depending on the venue. The fee is for a 10 x 10 booth space. If you draw and paint horse you may want to check on the horse shows for example. Everyone loves to look at art so it a matter of where you want to sell your work. Picking venues that have a huge attendance record is important. These are a great place to start and if you sell prints along with your original work it can be very profitable. The venue is filled with reasonable price treasures. Artist that mix fine art skills with crafts like hand painted items do really well. There are art competitions venues as well. There is usually a low fee starting out around $25 and the prize money ranges from recognition in your specialties to $1,000. These venues have restrictions on the submission, like the medium your using, when your work was completed and size requirements. competition is great for artist who want their art judged by their peers and are in it for the fine art they build their brand on. Best advice is to show up so people can meet the face behind the art. Going to the shows so you can meet the people who invest in fine arts. The information you need is found on the internet and through the state, city and local township offices. Some will direct you to parks and recreation or some other branch of local government. Traveling is a hard way to make a living, because you are always moving to an new venue and it can be costly and also very profitable. Artist are great researcher and find the best venues with the most traffic to sell there work. Selling art on the road you must take your gallery with you. Don’t count on the venue to supply you with stands, tables, chairs or cover from the rain. Some venues supply electricity and others are inside and will supply what you need but that will reflex in the booth fee. All do there own advertising and you should be use your contacts to let them know where you will be and new work you will be unveiling. This is my booth set up for traveling to different venue.